The Endovenous Radiofrequency Ablation (EVRFA) procedure is a minimally invasive treatment that uses radiofrequency (RF) energy to effectively treat patients suffering from varicose veins or Chronic Venous Insufficiency (CVI). 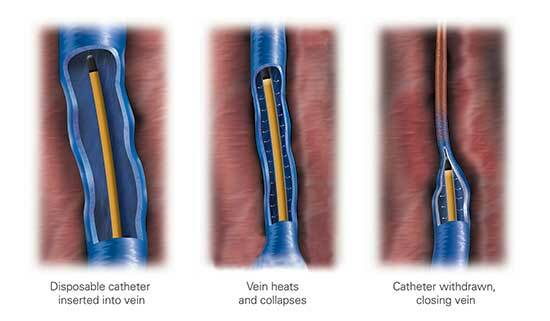 A vein specialist inserts a catheter into a diseased vein to provide consistent and uniform heat to contract the collagen in the vein walls, causing them to collapse and close. After the vein is sealed shut, blood is then naturally redirected to healthy veins. The vein simply becomes fibrous tissue after treatment. Over time, the vein will gradually be completely absorbed into surrounding tissue. We proudly offer the Venefit™ procedure, formerly known as the VNUS Closure™ procedure, for the treatment of varicose veins and CVI. The Venefit™ procedure is a minimally invasive segmental ablation treatment that utilizes radiofrequency (RF) energy to provide an even and uniform heat to contract the collagen in the vein walls, causing them to collapse and seal. Once the diseased vein is closed, blood will re-route itself to other healthy veins. The Venefit™ procedure allows for a quick, comfortable recovery and a return to everyday activities for the average patient, while also improving the appearance of varicose veins. The Venefit™ procedure has been proven in clinical studies to have excellent long term effectiveness, with less pain and bruising than endovenous laser*. What should I expect for the procedure? The procedure takes approximately 45-60 minutes, although patients may normally spend 2-3 hours at the medical facility due to normal pre- and post-treatment procedures. Most patients report feeling little, if any, pain during the procedure. Your physician will give you a local or regional anesthetic to numb the treatment area. Many patients experience a quicker return to normal activities. For a few weeks following the treatment, your vein specialist may recommend a regular walking regimen and suggest you refrain from very strenuous activities (heavy lifting, for example) or prolonged periods of standing. Most patients report a noticeable improvement in their symptoms within one to two weeks following the procedure. 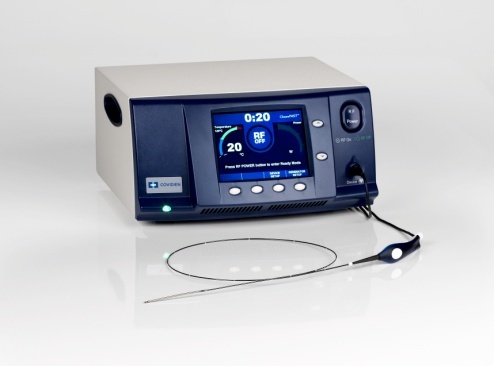 Why is radiofrequency ablation superior to laser ablation or vein stripping? The 2009 RECOVERY Study confirms that patients experience less bruising, and pain, and fewer complications with the Covidien ClosureFast™ endovenous radiofrequency ablation (RFA) catheter in comparison to 980 nm laser ablation.The procedure also results in little to no scarring and is generally performed using local anesthesia in a vein specialist’s clinic or a same-day surgical facility or hospital. Vein stripping is a surgical procedure, where, the surgeon makes an incision in your groin and ties off the vein, after which a “stripper” tool is threaded through the leg vein in order to pull it out through a second incision just above the calf.The EVRFA procedure, is minimally invasive. In contrast to vein stripping, the vein remains in place and is closed using a special catheter inserted through a small incision below the knee.Vein stripping is usually performed in an operating room under a general anesthetic, while the Venefit procedure is often performed using local or regional anesthesia. Laser ablation, on the other hand, uses laser heat to collapse and seal the affected vein. The laser targets the blood in the vein, which causes the blood to boil. This heat creates a steam bubble inside the vein, creating damage to the vein so that the vein collapses. Unlike the EVRFA procedure, laser temperatures can reach over 700 °C. Animal studies have shown that laser can potentially lead to perforation and destruction of the vein walls, causing significantly more bruising and post-procedure pain for patients. The 2009 RECOVERY Study compared the experience of patients treated with the radiofrequency procedure and those treated with 980 nm laser ablation. The findings clearly demonstrated that: Patients had less pain, less bruising and fewer complications. EVRFA proved to be up to four times faster in improving patients’ quality of life. The procedure has been shown in a large international, multicenter study to be 93% effective over three years. What are the risks for the radiofrequency ablation? As with any medical intervention, potential risks and complications exist with the EVRFA procedure. All patients should consult their vein specialist to determine if their conditions present any special risks. Your vein specialist will review potential complications of the procedure at the consultation, which can include vessel perforation, thrombosis, pulmonary embolism, phlebitis, hematoma, infection, paresthesia (numbness or tingling) and/or skin burn. What is Venefit™ targeted endovenous therapy? The Venefit™ procedure is a minimally invasive treatment option that uses radiofrequency (RF) energy to effectively treat patients suffering from varicose veins or chronic venous insufficiency (CVI). A vein specialist inserts the ClosureFast™ catheter into the diseased vein to provide consistent and uniform heat to contract the collagen in the vein walls, causing them to shrink and seal closed. Once the diseased vein is closed, blood will re-route itself to other healthy veins. How is the Venefit™ procedure different from the VNUS Closure procedure? The Venefit™ procedure is just a new name for the VNUS Closure procedure, providing the same clinically proven results with the same great patient recovery profile. How is the Venefit™ procedure different from vein stripping? During vein stripping, incisions are made in the groin and calf, and a tool is threaded through the diseased vein to pull the vein out of the leg. With the Venefit™ procedure, only one small incision is made at the insertion site and the vein is then treated and left in place. This minimally invasive approach reduces the likelihood of pain and bruising. How is the Venefit™ procedure different from endovenous laser? How long does the Venefit™ procedure take? The Venefit™ procedure takes approximately 45-60 minutes, although patients may normally spend 2-3 hours at the medical facility due to normal pre- and post-treatment procedures. Is the Venefit™ procedure painful? Most patients report feeling little, if any, pain during the Venefit™ procedure.3 Your physician should give you a local or regional anesthetic to numb the treatment area. Does the Venefit™ procedure require anesthesia? The Venefit™ procedure is usually performed under local or regional anesthesia. It is generally performed in a vein specialist's office or an outpatient surgical facility. Is there any scarring, bruising or swelling after the Venefit™ procedure? What potential risks and complications are associated with the Venefit™ procedure? As with all medical procedures, potential risks and complications exist including vessel perforation (when the catheter punctures the vein wall), thrombosis, pulmonary embolism (when a blood clot travels to the lungs), phlebitis (inflammation of the vein), infection, nerve damage, arteriovenous fistula (an abnormal connection between an artery and a vein), hematoma (bruising), and skin burn. As with all medical procedures, consult your physician to understand the risks and benefits of the procedure. Is the Venefit™ procedure suitable for everyone? Only a vein specialist can tell you if the Venefit™ procedure is the right option for your vein problem. Experience has shown that many patients with varicose veins or CVI can be treated with the Venefit™ procedure. Is age an important consideration for the Venefit™ procedure? The most important step in determining whether or not the Venefit™ procedure is appropriate for you is a complete ultrasound examination by your vein specialist. Age alone is not a factor in determining whether or not the Venefit™ procedure is appropriate for you. The Venefit™ procedure has been used to treat both women and men across a wide range of ages. How effective is the Venefit™ procedure? Is the Venefit™ procedure covered by my insurance? Many insurance companies pay for the Venefit™ procedure in part or in full. The Venefit™ procedure has coverage policies with major health insurers. Please discuss your coverage with your insurance provider prior to seeking treatment.